I managed to keep interested enough to get another month of World of Warcraft. I decided it was time to get my other artifact weapons. I started my legion journey with Titanstrike and used it from level 98 to level 110 and item level 860 before I made the decision to try the other two artifacts. I invite you to journey with me on each of the quests. At the end I give my thoughts on the experience. As I mentioned in my last blog post1)My last article about leveling my hunter on a new server Titanstrike is the artifact weapon for the Beast Master specialization and with a story that focused on titan lore. You start the quest by breaking into a tomb of Vrykul Warlord, Volund. You are sent and aided by the dwarf Grif Wildheart2)Grif Wildheart Wiki https://wow.gamepedia.com/Grif_Wildheart , who has been working with Brann Bronzebeard3)Brann Bronzebeard Wiki https://wow.gamepedia.com/Brann_Bronzebeard, and a vrykul named Prustaga, who Grif calls Prust. We broke into the tomb and found it full of titan artifacts. Grif saw a mechagnome and reactivated it, hoping it would help find Titanstrike amongst all the titan artifacts. As soon as it was activated it was taken over, much to Grif’s announce, by Mimiron4)Mimiron Wiki https://wow.gamepedia.com/Mimiron. Mimiron thought Grif was Bronzebeard and continued to call him Bronzebeaerd from here on out, despite Grif’s annoyance and insistence that he wasn’t Bronzebeard. Mimiron used the Makers Console to triangulate the Titanstrike signal and by following his directions I found the artifact, but Prust had other plans. As soon as I reached for the weapon she stunned us, took Titanstrike for herself and teleported away. Mimiron activated the teleportation pad in the room and we teleported to him in Uldar. Once there he used the mechagnome and the maker’s console to triangulate the location of Prustaga and Titanstrike. The process was fraught with troubles and I had to help keep Mimiron safe while he is tinkered with the console. Eventually he found her; she was heading to the Watcher5)Wiki Entry for Watchers https://wow.gamepedia.com/Titanic_watcher Thorim6) Thorim Wiki https://wow.gamepedia.com/Thorim. Along the way Mimiron explains that she is tying to fuse the titan spark, the power of Titanstrike, into herself to become a living god. We arrive just in time to fend off wave after wave of vrykul. She managed to take the thunderspark and absorb it into herself but we didn’t give up. We fought on, hoping to stop her before she could fully realize her power. We beat her down but that only drove her to draw upon even more power. That’s when Hati7)Hait Wiki https://wow.gamepedia.com/Hati, the lighting wolfhound of Thorim, went in for a killing blow. Prustaga exploded and all the power of the titan spark was absorbed by Hait who laid there dyeing. To save her life and to save the power within her from dissipating into nothingness I took hold of Titanstrike and used myself as a conduit to calm the powers of Titanstrike and return it to the weapon. It worked but it is now forever now linked with me and the wolfhound Hati. The Marksmen Hunter’s weapon is the bow called Thas’dorah. I meet Vereesa Windrunner 8) Vereesa Windrunner Wiki https://wow.gamepedia.com/Vereesa_Windrunnerat the Broken Shore. She told me that the bow last belonged to her sister Alleria 9)Alleria Windrunner Wiki https://wow.gamepedia.com/Alleria_Windrunnerand she would like my help investigating the claim that she has been captured by the Legion. Ranger Orestes10)Ranger Orestes Wiki https://wow.gamepedia.com/Ranger_Orestes feared it might be a trap but Vereesa said she must go and find out the truth despite the risk. Magus Solgaze11)Magus Solgaze Wiki https://wow.gamepedia.com/Magus_Solgaze had given her portal stone to take us back to Dalaran at a moment’s notice, just in case. Vereesa told Orestes to stay behind till the she knew if it is a trap or not but as soon as she opened the portal to the Legion controlled world he jumped through the portal ahead of us. We quickly followed but he went on a without us. We fought through demons and eventually found him fighting the Hound Mistress, Torvis. We saved him but we were ultimately too late, he was gravely wounded and died before us. I took the bow and we quickly left before we were overwhelmed by Legion forces. The spear, Talonclaw, is the weapon for the last of the hunter specializations, Survival. I met Apata12)Apata Highmountain Wiki https://wow.gamepedia.com/Apata_Highmountain of the Highmountain tribe who told me it was an honor to have me help her and her brother Wuho13)Wuho Highmountain Wiki https://wow.gamepedia.com/Wuho_Highmountain to find the spear. She explained that the spear belonged to Huln Highmountain14)Huln Highmountain Wiki https://wow.gamepedia.com/Huln_Highmountain but was lost many years when Chieftian Dorro15)Dorro Highmountain Wiki https://wow.gamepedia.com/Dorro_Highmountain took the spear to fight a corrupted nightsaber terrorizing her people. It has been ages but the nightsaber has once again surfaced and must be defeated. The first leg of the journey took us to Spiritwatch Point. Apata informed me that Talonclaw is linked to the spirit Ohn’ahra16)Ohn’ahra Wiki https://wow.gamepedia.com/Ohn%27ahra and tradition dictates that that we first get her blessing before adventuring for the spear. Once there I found that the spirit had been imprisoned by Degar Bloodtotem.17)Degar Bloodtotem Wiki https://wow.gamepedia.com/Degar_Bloodtotem I promptly killed him and rescued the spirit, who then gave me her blessing. Afterwards we flew to the swamps of Stormheim where the beast was trapped behind some wards erected by the Kvaldir, who we immediately fought. We found a way to breach the ward and searched through the mists for the beast. We trapped it and attacked but the beast broke free and we chased it, caught it again but again it escaped. We were bruised and bloody but we continued on. We pursued it to its lair, a cave deep in the swamps. We stored the cave and killed the beast in it’s lair. Among the bones of it’s victims we found the spear Talonclaw and I took possession of the awesome weapon. Upon taking possession of the weapon the spirit of Dorro appeared and thanked us for finally putting his spirit to reset and he teleported us back to Dalaran. Between the three quests I found the quest for Titanstrike the most interesting but that could be my preference to the story material; I love me some dwarf and titan lore. Aside from my own bias it also felt the most epic of the three. You are literally fighting to stop someone from taking the power of a god and enslaving the vrykul race. With Thas’dorah you are just looking for someone’s sister and with Talonclaw you are hunting a deadly beast. At least with Talonclaw you are doing something that is very much like a hunter. You are literally hunting down a beast, you release flairs, track and set traps. It feels very much like a hunter type quest, more so than the other two. 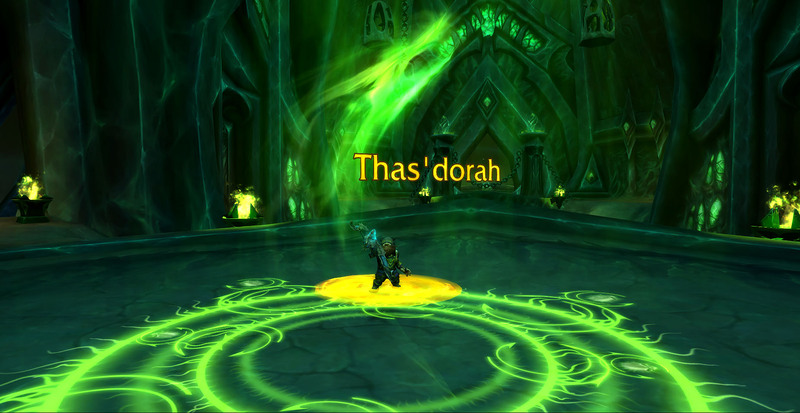 With Thas’dorah it really feels misplaced. The story is very generic and really doesn’t cover much material. It feels more like a side quest than it does being part of an epic story., even if there are some big names dropped. I also found that I don’t particularly like Marksmen. I died on that quest, a lot. I know some part of that is just how different that specialization plays from Beast Master and Survival but it also just felt weaker. There seemed to be a bigger focus on spreading damage amongst several enemies than a focus on one or two at a time. This problem was further compounded by how the quest was structured. Rather than getting to use the multi-attack capabilities of the Marksmen, you had to focus on one or two beefy enemies at a time. I just couldn’t do the damage like I could with the other specializations. Of course, that doesn’t mean that the specialization doesn’t have its place in the game, it all depends on your play style. It just didn’t fit me.